Are you looking for great Personalised Sweet Jar Gifts for a special occasion? If so, we may have just the gift you are after as our personalised sweetie jar gifts cover many different occasions including birthdays, weddings, mothers day and even personalised sweet jars for teachers gifts! Almost everyone loves sweets and many of these people would be absolutely delighted to receive a whole jar of the lovely items. Add to that some thoughtful messages and you have personalised sweet jar gifts that are fun and taste great as well. 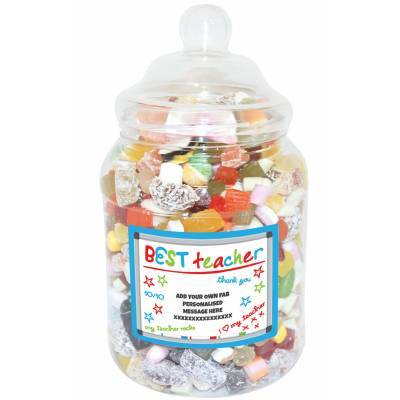 You would be amazed at the different types of sweets, jars, designs and messages that are available to view on our website so please take some time and have a look. We have lots of personalised sweet jar gifts from UK retailers, just compare the great offers and choose the most suitable for the gift you require. You can get a great value deal and save time and money as well, everyone's a winner! Maybe you want to compare sweetie jar gifts that hark back to years gone by and if that is the case then please consider the personalised sweet jars Retro gifts, they are jam-packed with all the old favourites and the full colour label is there to display the name of your choice. Now here are just some of the lovely sweets that are inside this fantastic package: Fizz Whizz, Flying Saucers, Mini Love Hearts, Refresher Bars, Gobstoppers, Dib Dabs and lots more. The labels have colourful designs for great birthday occasions such as 18th, 21st, 30th, 40th & 50th birthday personalised Retro sweet jars. Imagine a whole jar stuffed full with favourite sweets and add a colourful label with a person's name and you have a fantastic personalised sweetie jar gift to delight some really lucky person on any special occasion such as a birthday, or Christmas etc. And please don't forget your precious Mum and Dad on their special days and buy them personalised sweet jars for Fathers Day and Mothers Day; and if they share them out then get them some sweets again on their birthdays!